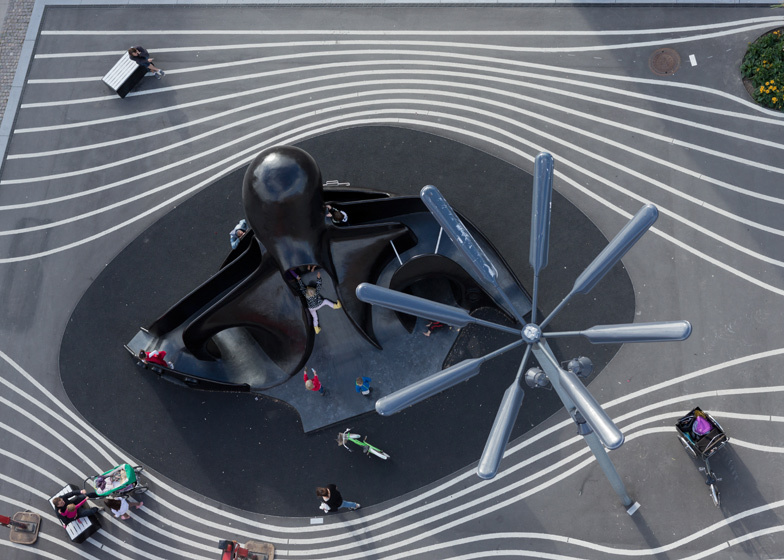 Danish architecture firm BIG has scattered miscellaneous street furniture from 60 different nations across a brightly coloured carpet of grass and rubber at this park in Copenhagen (+ slideshow). 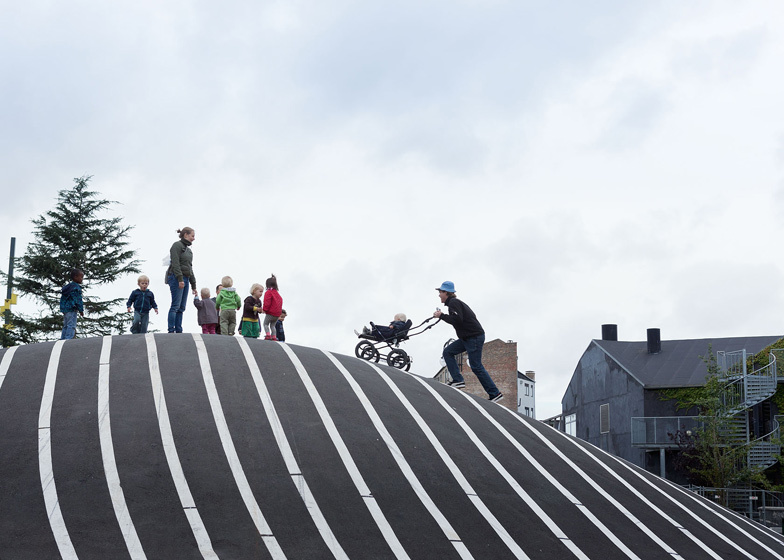 The architects worked alongside landscape architects Topotek1 and artists Superflex on the design of the Superkilen park, which stretches 750 metres through the Nørrebro neighbourhood in the north of the city. Neon signs from Russia and Qatar, picnic benches from Armenia and ping-pong tables from Spain are just some of the different objects in the park, which are meant to represent the nationalities of every local resident. 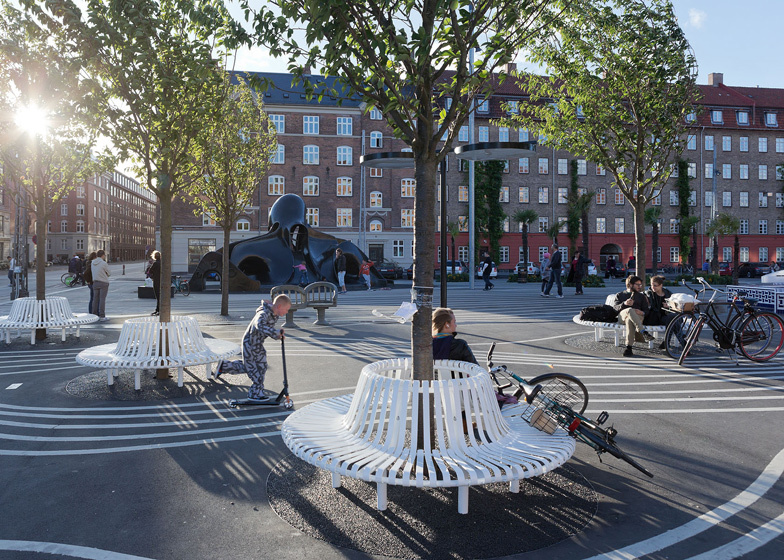 "Rather than plastering the urban area with Danish designs we decided to gather the local intelligence and global experience to create a display of global urban best practice comprising the best that each of the 60 different cultures and countries have to offer when it comes to urban furniture," said BIG project leader Nanna Gyldholm Møller. 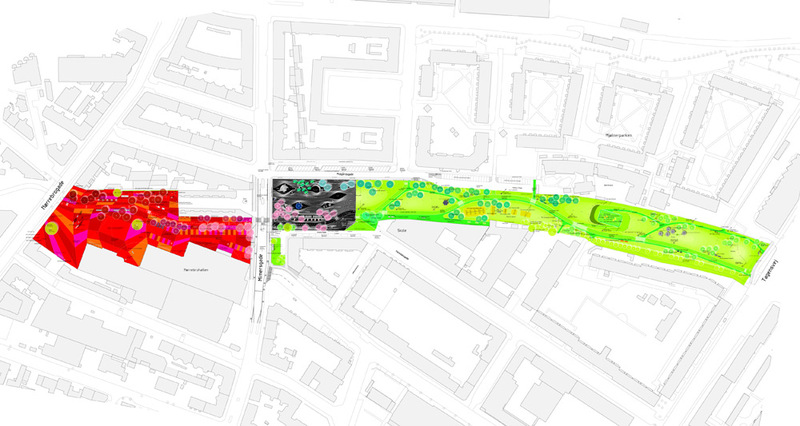 The park is split into three colour-coded zones and different objects can be found in each one. 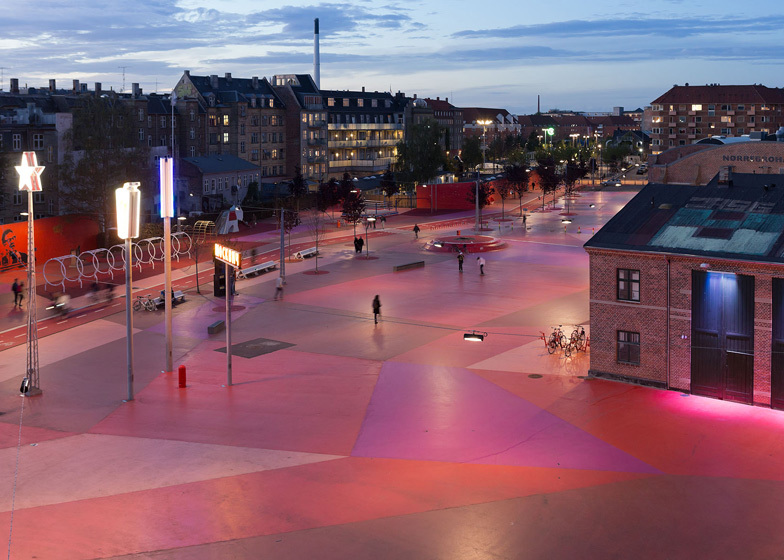 A patchwork of pink rubber blankets the ground and covers the sides of buildings in the first zone, and the designers have planted maple trees with matching red leaves. 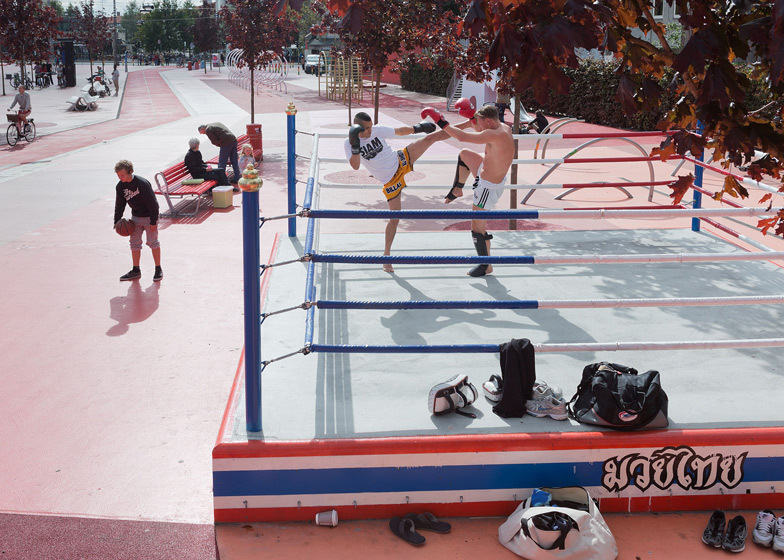 The local market is held here, beside benches from Brazil, cast iron litter bins from the UK and a Thai boxing ring. 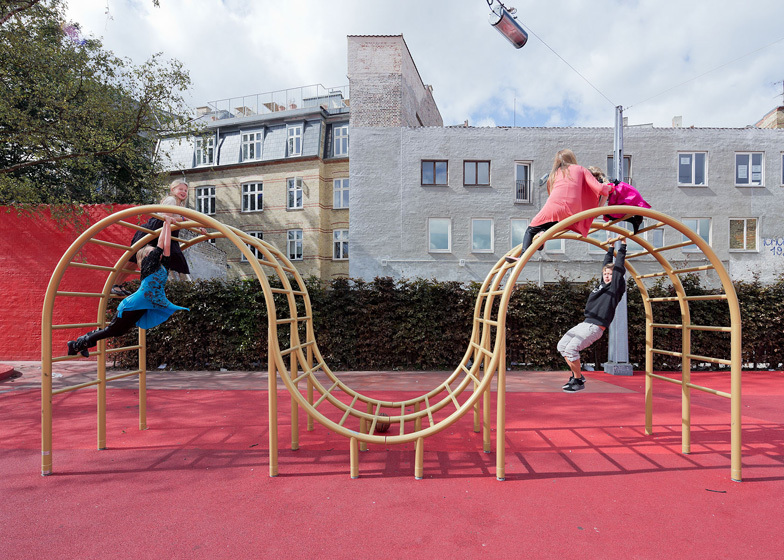 There's also a children's playground, containing a slide from Chernobyl, a climbing frame from India and a set of swings from Iraq. 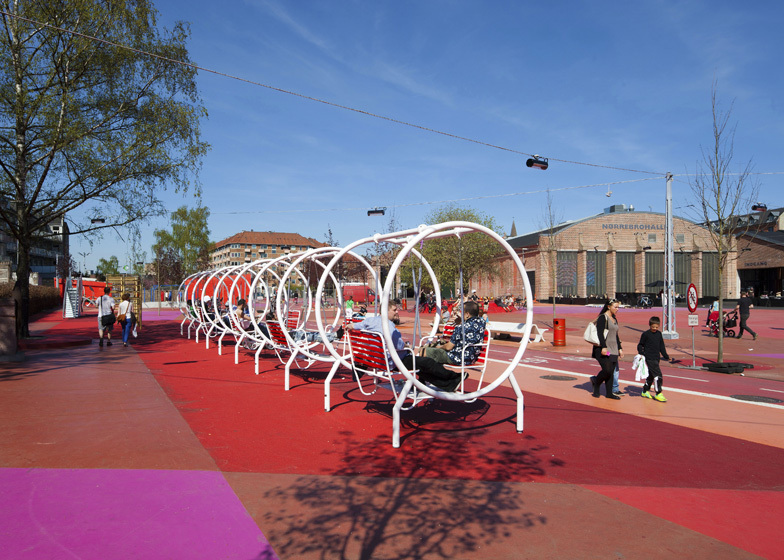 The second zone is conceived as an "urban living room" where locals play board games beneath the shelter of Japanese cherry trees and Liberian Lebanese cedar trees. 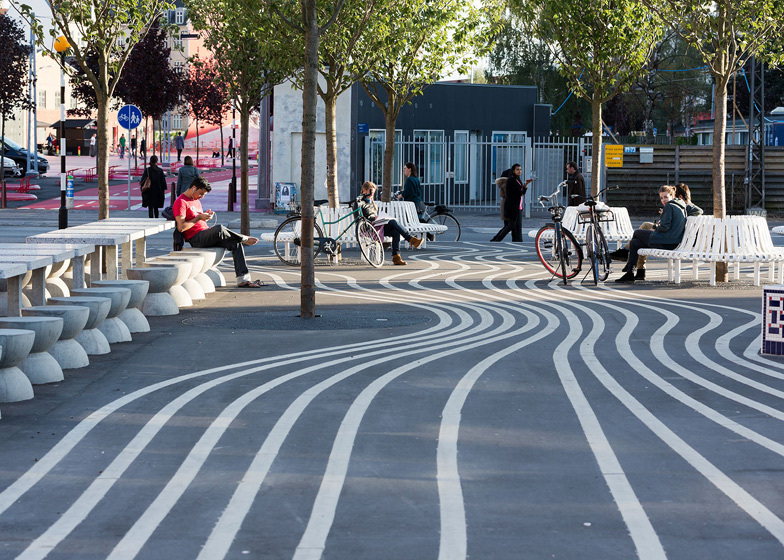 Painted white lines run north to south across the ground but curve around the outside of the street furniture, which includes Belgian benches, Brazilian bar chairs, a Norwegian bike rack and a Moroccan fountain. Grass plains and hills comprise the third zone, which contains areas for sports, sunbathing and picnics. A Texan pavilion provides a venue for line-dancing, while a sports arena accommodates football and basketball. 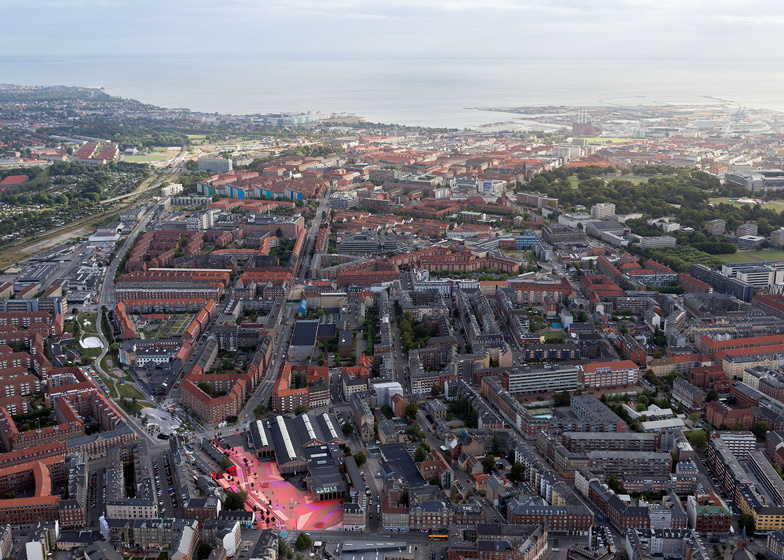 "Rather than perpetuating a perception of Denmark as a mono-ethnic people, the park portrays a true sample of the cultural diversity of contemporary Copenhagen," said Topotek1's Martin-Rein Cano. 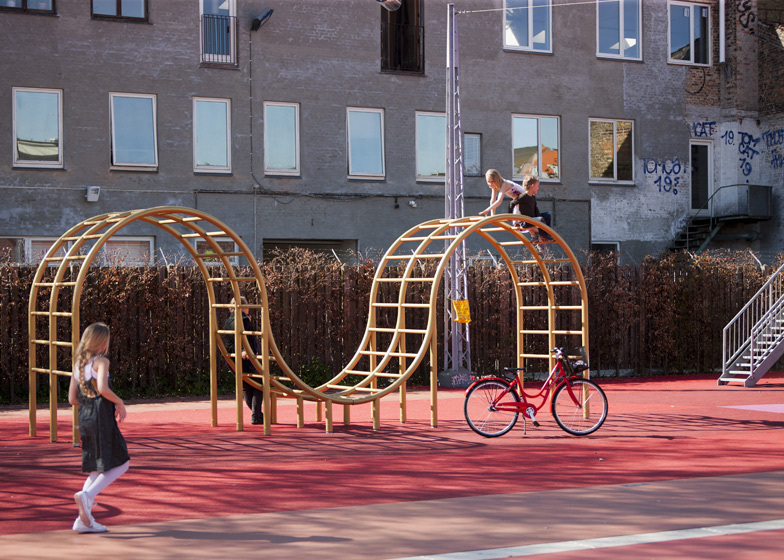 See the initial designs for Superkilen in our earlier story. 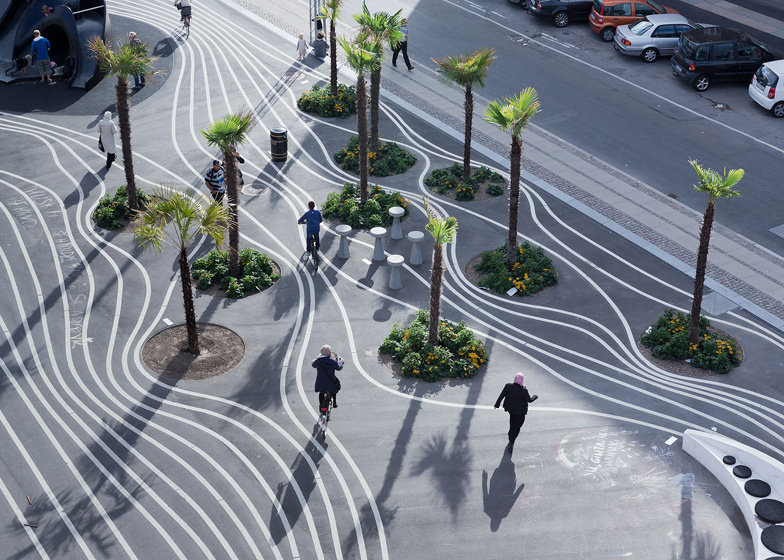 Other landscape architecture on Dezeen includes an undulating public square in Mexico and a plaza in Austria. Photography is by Iwan Bann, apart from where otherwise stated. 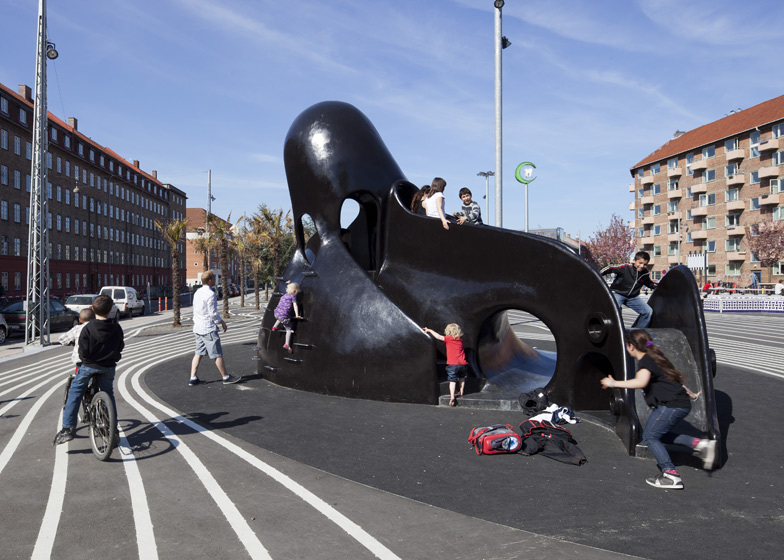 Superkilen is the result of the creative collaboration between BIG, Topotek1 and SUPERFLEX, which constitutes a rare fusion of architecture, landscape architecture and art - from early concept to construction stage. 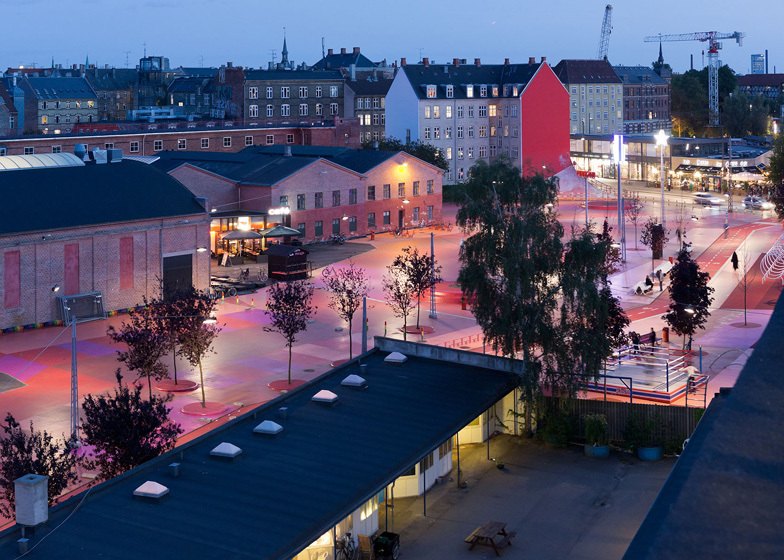 In addition to the cultural and sports facilities, the Red Square creates the setting for an urban marketplace which attracts visitors every weekend from Copenhagen and the suburbs. » The red square is defined by a street in each end and building and fences along the sides. The edge is moving in and out - and we have tied the area together by connecting the surrounding given lines and edges in the big red pattern. A big red carped stretched out between all sides of the square. 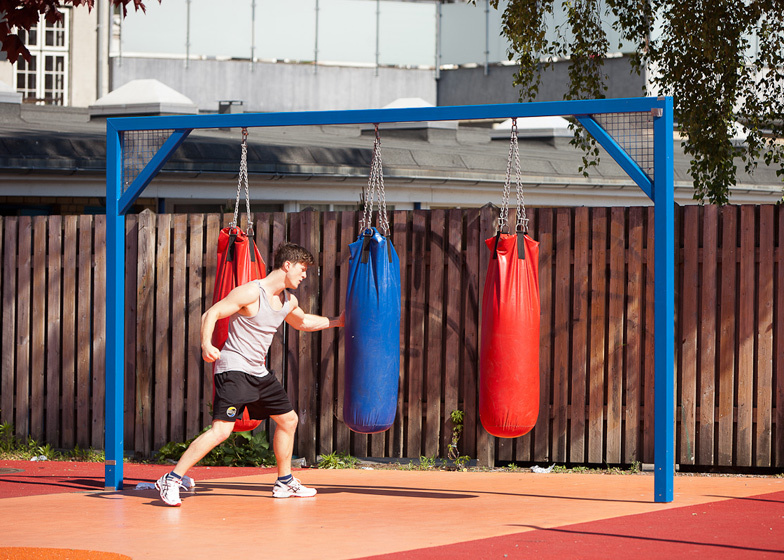 » Fitness area, Thai boxing, playground (slide from Chernobyl, Iraqi swings, Indian climbing playground), Sound system from Jamaica, a stencil of Salvador Allende, plenty of benches (from Brazil, classic UK cast Iron litter bins, Iran and Switzerland), bike stands and a parking area. » Only red trees except the existing ones. » Basket ball next to parking. » The square can be spotted by the big, dentist neon sign from Doha, Qatar. » Brazilian bar chairs under the Chinese palm trees, Japanese octopus playground next to the long row of Bulgarian picnic tables and Argentinean BBQ’s, Belgian benches around the cherry trees, UV (black light) light highlighting all white from the American shower lamp, Norwegian bike rack with a bike pump, Liberian cedar trees. » To protect from the street ending at the north east corner of the square and to meet the wishes from the neighbors, we have folded up a corner of the square creating a covered space. 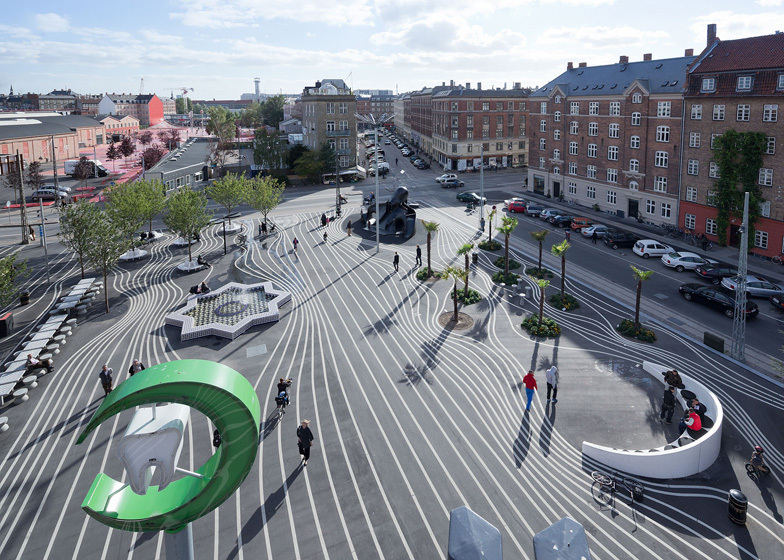 » Unlike the pattern on the red square, the white lines on Mimers Plads are all moving in straight lines from north to south, curving around the different furniture to avoid touching it. Here the pattern is highlighting the furniture instead of just being a caped under it. 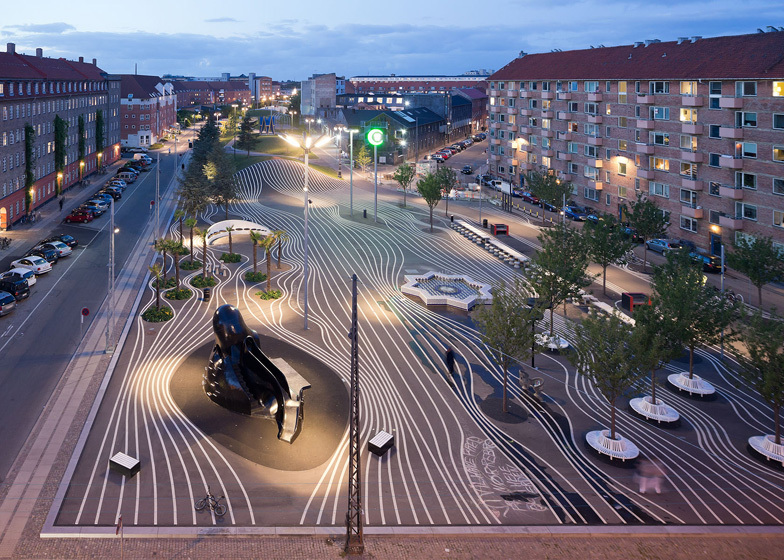 » The neighbors asked for more green so we ended up making the green park completely green – not only keeping and exaggerating the curvy landscape, but also painting all bike- and pedestrian paths green. 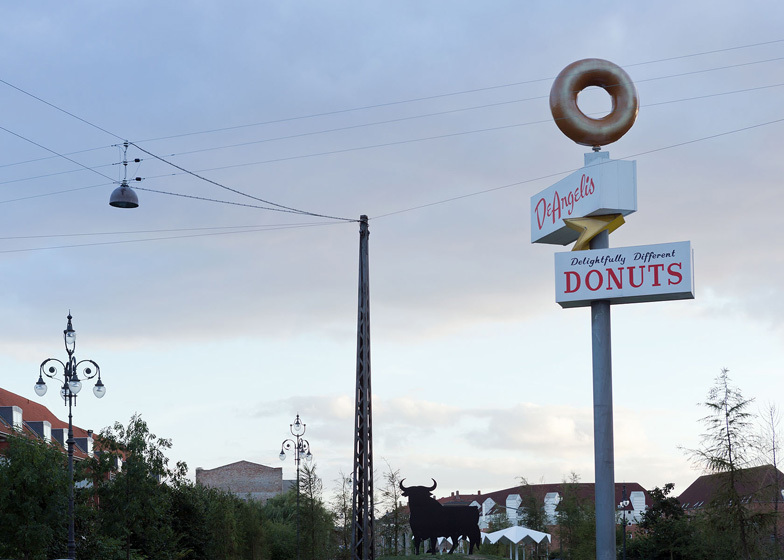 » From Tagensvej at the very north, the park is welcoming with a big rotating neon sign from USA, a big Italian chandelier and a black Osborne Bull from Costa del Sol (a wish from a Danish couple living in the area!). » Armenian picnic tables next to Mjølnerparken with South African BBQ’s, a volcano shapes sports arena for basket ball and football, a line dance pavilion from Texas, muscle beach from LA with a high swing from Kabul, Spanish ping pong tables and a pavilion for the kids to hang out in.